New handheld spectrum analysers from Agilent Technologies. 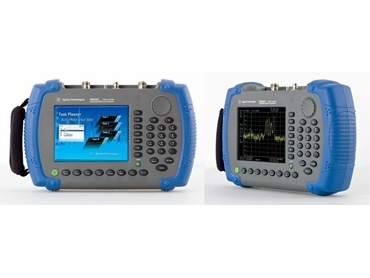 Agilent Technologies has introduced the N9344C and N9343C handheld spectrum analysers (HSA) that make field testing easier for technicians and engineers who install, maintain and troubleshoot RF/microwave systems, monitor the spectrum or manage interference in the field. Providing the performance of a benchtop instrument in a compact and mobile design, the HSA’s also include a range of functionality for ensuring field-ready operation and automating routine tasks. The handheld spectrum analysers are suitable for a variety of industries and roles including aerospace and defence, microwave and satellite communication, wireless communication and broadcasting, spectrum regulation and general purpose spectrum analysis. Agilent's N9344C and N9343C HSAs provide quick, consistent and accurate measurement from 1 MHz to 20 GHz and 13.6 GHz, respectively with both instruments able to be tuned up to 9 kHz. A rugged, fanless design allows users to operate in tough field environments with automatic LCD brightness and keypad backlight control for dark conditions. Further simplifying the measurement process is the handheld spectrum analysers built-in tracking generator and time-gated sweep. The HSA’s unique Task Planner capability reduces test setup time by 95% and allows automation. Routine measurement tasks can be automated with continuous execution of up to 20 different tests and test results captured and reports generated automatically. Dedicated applications ensure faster, easier spectrum monitoring and interference analysis while precise location information is ensured with the spectrum analyser’s built-in GPS receiver and GPS antenna. The N9344C and N9343C HSAs can also be remotely controlled via a USB/LAN connection. First time measurement accuracy is provided with the N9344C and N9343C HSAs best-in-class RF performance (-155 dBm/Hz DANL, minimum sweep time < 2 ms) and support for Agilent USB power sensors. A set of one-button measurements and AM/FM modulation analysis help characterise the handheld spectrum analyser’s signal quality.